Michael Hilsman is an artist. Almine Rech Gallery is pleased to announce the upcoming exhibition, Pictures of M. and Other Pictures, Michael Hilsman’s first solo show with the gallery. 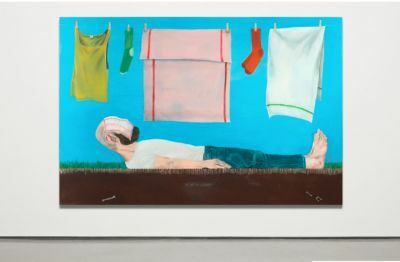 A recurring figure in Hilsman’s large-scale paintings shows a marked sense of vulnerability: With graying beard and balding head, the man hides himself from the viewer, lurking behind oversize foliage or covering his face with a gingham napkin. Only pieces of his body are visible, sometimes surrounded by other human parts—a buried bone lies below the man’s supine figure in ‘M.’ with Laundry; an extracted molar floats next to his head in ‘M.’ with Idioms (Tooth and Nail). Like Bolaño’s fictional painter who enshrines his own amputated hand in a self-portrait, the fragmented figure of “M.,” a painted character in close proximity to Hilsman himself, underscores the body’s frailty, its awkwardness and mortality, and the disarming imperatives of being an artist—the discomforts of public exposure, the frequent mortification of self-expression.